The UK has 12 naturally occurring species in these two biological classes, 6 Amphibians and 6 Reptiles. There are a number of introduced species which will not be listed or discussed unless evidence of these are reported on the Reserve. The number of species recorded on the Reserve is as expected also low, but, numbers of individuals is very significant in a few of these species. The following data is abstracted from the 1985 Management Plan, Annual Reports from 1980 and reported Reserve sightings to the end of 2014. Found on all four beds. Although seldom seen, are common and can be found in large numbers. The newt survey of October 2006 recorded 2162 over a 40 day period, on No1. Bed, in the trapping and re-siting project prior to commencement of the landfill operation which is still in progress. Smooth Newts along with Common Frog are our most widespread amphibian. Both sexes have greenish-brown (often dark) upperparts with pale bellies with an orange hue, more pronounced in the male than female. The body is covered in very dark spots, larger and bolder in the male. Size range is around 10 to 12mm, the male slightly smaller than the female. In the breeding season the male develops a wavy dorsal crest from head to tail. Similar to the Palmate Newt, breeding males can be separated by fringed not webbed hind toes and generally have a more developed wavy dorsal crest. The pale-whitish throat with dark spotting/speckling will identify the females Smooth Newts. Smooth Newts spend most of their adult life on land, heading to water in spring for breeding. They survive winter in refuges, sheltered under stones and logs etc. Photograph - no Woolston Eyes image is available. The Great Crested Newt’s body is generally dark to black and is significantly larger, up to 16mm, than the related Smooth Newt up to 11mm, to be found on the Reserve. This newt has a ‘warty’ skin, compared with the smooth skin of, yes, the Smooth Newt. A common synonym for the Great crested Newt is the Warty Newt. The under-belly is orange with black spots/markings which are actually unique to each individual. Sexes can be identified by the orange line on the tail of the female in all seasons. In the breeding season male Great Crested Newts develop a dorsal crest from the head to tail and exhibit a silver line on the tail. Juveniles look like females but have a yellow stripe along their back. They leave the water around August/September to overwinter on land in similar habitats to the Smooth Newt. Great Crested Newts are the UK’s most threatened newt so it was extraordinary to find the numbers on No.1 Bed in the 2006 Amphibian Survey (which can be viewed at the top of this section) making Woolston Eyes a nationally important site for this species. Who hasn’t seen a Frog? They are typically shades of browny-yellow to browny-green in colour. The undersides are pale-whitish, flanks yellower and the upper surfaces exhibit darker markings from tan to brown to black. The hind feet are webbed and the strong hind legs feature dark banding. Found on all beds, throughout the beds. The Amphibian Survey of 2006 - viewable via a link at the top of this section - on No.1 Bed provides some indication of the numbers across the reserve if extrapolated. Males tend to be slightly smaller than females and can be identified by whitish swelling on the inner digits of the front feet. Coomon Frogs hibernate during winter, either at the bottom of ponds, breathing through their skin or under log piles, compost heaps and the like. During the rest of the year they tend to be land based. Males return to breeding sites during spring ahead of the females and it is thought they return to their natal ponds. The females lay up to 2000 eggs, frogspawn, with the young tadpoles emerging after around 14 days. Metamorphosis into adults takes around 10 to 15 weeks. Tadpoles are predated by a large range of aquatic creatures, including the newts above. No Woolston image is available. 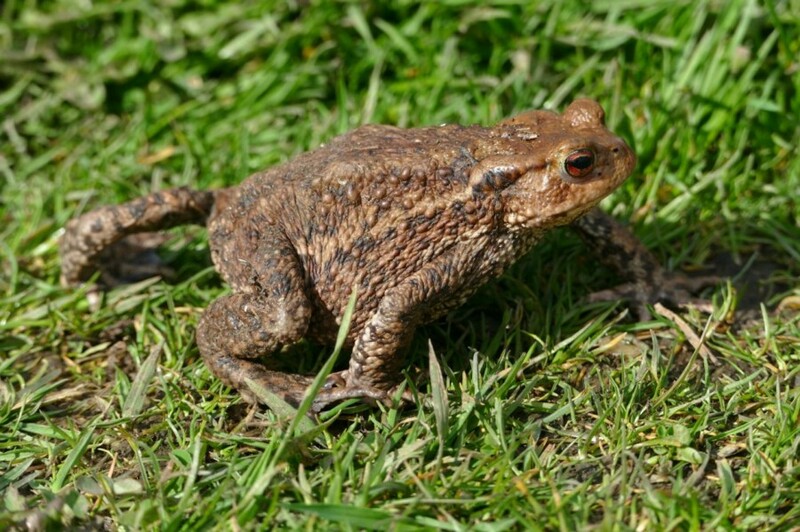 As the name suggests, this is the UK’s most widespread toad and is found across the Reserve. The 2006 Amphibian Survey for No.1 Bed identifies the extraordinary numbers that are present on the Reserve, making Woolston Eyes a nationally important site for this species. Their colour range is simliar to their cousin, the Common Frog, being yellow-brown through grey-brown to olive-green and all have a ‘warty’ skin which together with their ‘squat’ statue easily identifies them from Common Frog. Common Toads tend to walk rather than jump as Frogs do. They are land based, only returning to water to breed in springtime. Toad eggs are easily separated from Frog ‘spawn’ as they are laid in long, often three stranded ribbons through the water vegetation. The tadpoles hatch after around ten dys and completely metamorphose in around two months. They hibernate in winter under log piles, in crevices under large stones and in deep leaf-litter/vegetation. Toads are surprisingly long-lived, 30-40 years maximum. The only evidence leading to the suggestion that Adder is present on the Reserve dates back to 1983 when a bullock with a head wound was seen by a Veterinary Surgeon who considered the wound to be consistent with a snake bite. The Adder, the UK’s only venomous snake, also known as the Common Viper, is found in a wide variety of habitats. It is recognisable by the central dark zig-zag markings, bordered by dark spots, along its back, from head to tail and a dark mark often ‘V’ shaped but can take the form of an ‘X’ or ‘H’ at the back of the head. The Adder hibernates in winter, emerging in early spring, males first, and April is one of the best times to look for ‘skin casts’ as they will shed their skin soon after emerging. Females do so approx. a month later. Adders are, viviparous - bear live young rather than lay eggs around August - early September. The only record which relates to Slow Worm dates back to 1984 when a Warden, David Edwards reported one on 19/05/1984. Slow Worms are legless lizards, not worms as their name implies or snakes which they are often mistaken for. They first appear from hibernation around March and adults have a smooth, shiny appearance with a grey or bluish belly. Males differ from females in colour, they tend to vary between greyish, brownish or coppery and typically lack any stripes. The females are brownish, or coppery on the back with brown or dark sides with lighter iridescent flecking. Many females have a dark strip down the centre of the back and running along their sides. Individuals may have bluish spots which is more common amongst males. Breeding takes place through May and June. Slow Worms are ‘ovoviviparous’ with the young born live but are initially encased in an egg sac typically in August or September. The juveniles have an iridescent silver-gold-bronze-coppery back with brown or black sides and take up to eight years to reach maturity. Slow Worms are extremely long lived, 50 years has been noted. They shed their skins regularly during their life. 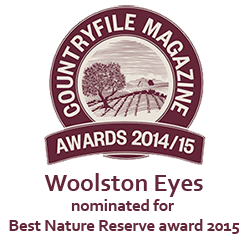 Common Lizards have been reported on both No1. and No2. Beds. An extremely variable coloured lizard but typically brownish upper-parts with dark lines running down the back. these are often bordered yellowish or creamy. Individuals however, can be coloured green, grey or reddish upper-parts which gives rise to identification issues. The male has a bright underside, typically yellow-orange (rarely reddish) with dark spots. Females in contrast have a duller but paler underside. Males can also be identified by the prominent swelling at the base of the tail. The Common Lizard is cold-bloodied and spends a lot of time basking, especially in early spring, to reach an optimum body temperature of 30oC which makes this the best time to search for them. This is an introduced species which is now listed as ‘invasive’. Woolston Eyes holds a feral population along with the Manchester Ship Canal. Typically these terrapins grow to a carapace size of 120 - 200mm across and get their name from the distinctive red slash around the head area were their ears would be expected. They are a sub-species of Common Pond Terrapin and originate from release of pets. Young specimens start leaf-green in colour but this fades darker with age. The soft body parts, head legs and tail are greenish with pale yellow irregular stripes. 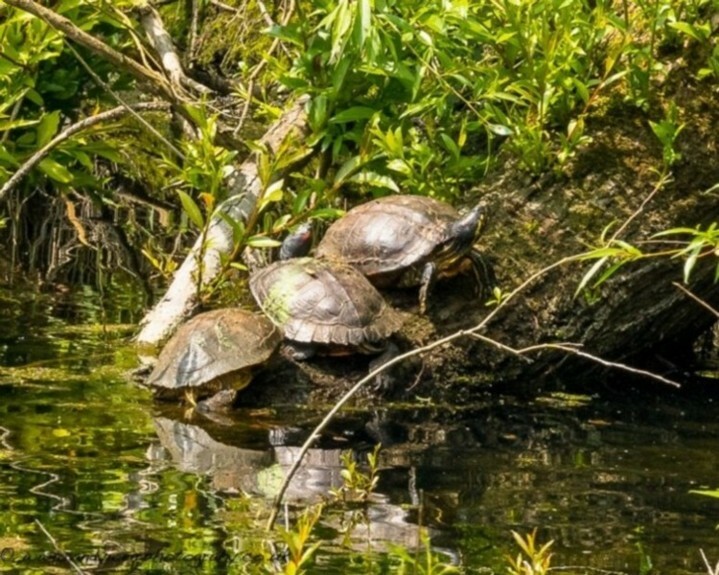 Red-eared Terrapins are cold-bloodied and must regulate their body temperature by basking in the sun. They do not hibernate but ‘brumate’, effectively shutting down their bodies to survive, predominately at the bottom of ponds and water bodies, occasionally rising to breathe.